I had mentioned that I made a clandestine trip to my local dump specifically to get a half barrel sized metal drum. As luck would have it - I found exactly the size I was looking for. The idea was to build a more durable version of the dependable 'Econo Norse' firebrick smelter. (Go HERE to see the layout drawing) The drum was just about exactly the same size as a hexagon arrangement of standard hard bricks - stacked the normal three sets tall. The result is a smelter containment that is roughly 20 cm internal diameter, but still at the normal plus 40 cm above the tuyere. I cut the required holes and ports into the barrel, and welded in some external and internal fittings and supports. On the lower view, you can see the removeable 'hatch' that covers over two of the lower ring of bricks which can be pried loose for either a large tap arch or for a possible bottom extraction. Although these bricks are also backed up with the clay and charcoal fines cobb, they were wrapped with paper first to make removal later easier.The section of barrel that was cut away to create the hatch is held back in place by a length of flat bar which also forms a simple handle. A rectangular hole was cut the same size as the brick that holds the tuyere and sits above it. This brick is made of low density fire brick which has been cut in half to about 2 cm thick. If past experience proves correct, this material should radiate excess heat on its outside surface - and reduce erosion. Looking down from the top, the cobb packing holding the bricks into place can be seen. The packing is a rough triangle in the gabs of hexagon pattern of the bricks. An air space has been deliberately left between the flat sides of the bricks and the curvature of the circular barrel. The hope is that this will allow some of the excess heat to bleed off into the gaps. Hopefully the smelter will prove to be reusable. The reduced size and the hard support provided by the barrel should make the furnace body easy to move on a two wheeled cart. Although the fire bricks make it fairly heavy, two people should be able to pick it up to load it into a vehicle. This smelt was to be a second test of the DARC Dirt 1 - bog iron ore analog developed by Gus GIssing. The first test (at Smeltfest 08) was not ideal, as the smelter layout was a new type we had little experience with. The dynamics of the 'bellows plate' type furnace, and its taller stack height combined to a low yield and very high carbon bloom. In this case the mix of 80% 'Spanish Red' (Fe2O3) / 10% silica sand / 10% flour had been air drying for about a week. The cold and wet weather had slowed this process. At the time of the smelt the ore material was dry enough to easily handle, but still slightly damp to the touch. It was broken up from the large plate pieces (roughly 1 cm thick) by tapping through a 2.5 cm wire grid with a wooden mallet. A second screen, about 3 mm, was used to separate out the fine dust. (This step was not done for the Smeltfest test). The result was pulling off about 20 % of the prepared material as dust. 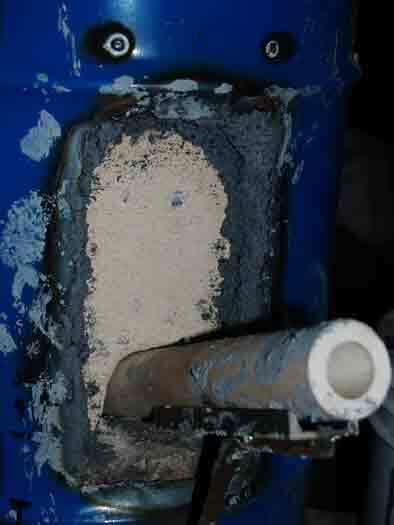 As the analog was not baked this time, this dust can easily be incorporated into the next batch by just adding water. It was generally thought that the pieces from the 2.5 cm grid may have been a bit too large. Use of a 1.5 cm grid is likely ideal. The team consisted of: Ken Cook - smelt master Darrell Markewitz - assisting (and coaching) Neil Peterson - measuring and recording Lloyd Johnson came up to observe and assist with the final hammering of the bloom. There was considerably less prep work required, other than the construction of the more durable metal can for the smelter. The charcoal used was the Black Diamond from Bruce Cowan, which was pre-crushed to the ideal size. 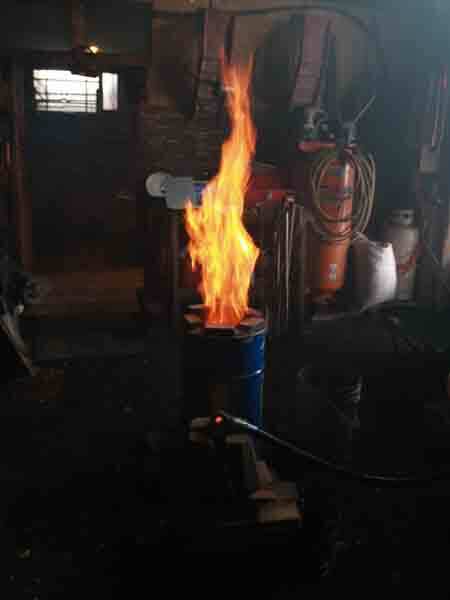 This experiment employed a number of new pieces of equipment: 1) The smelter itself, which was a smaller variation on our well proven fire brick construction Econo Norse furnace. 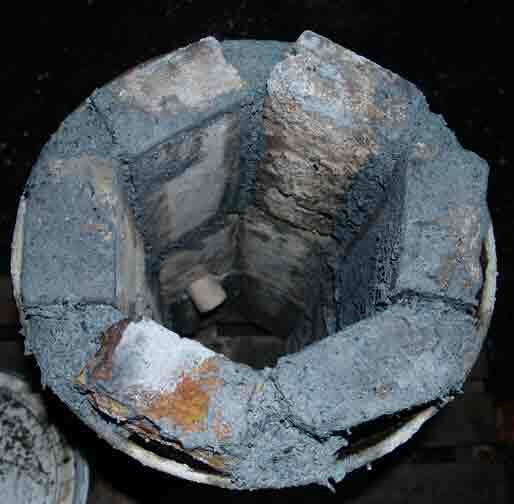 This furnace was 20 cm in diameter, a change which is a considerable reduction to our normal size of closer to 30 cm. There was some concern that this roughly 40 % reduction in volume might prove a problem with the dynamics of the furnace. 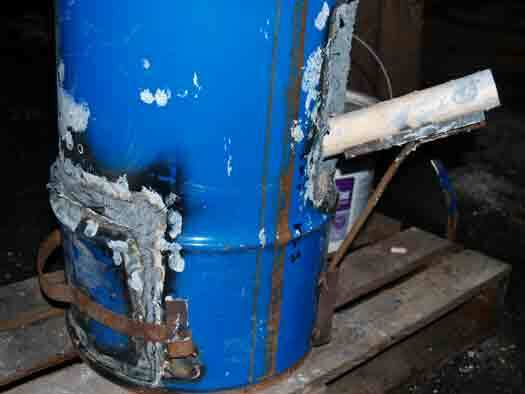 I was encouraged by Skip Williams' recent experiments with very small table top sized furnaces. 2) The use of the new, larger volume, electric blower I had just purchased. This is the same blower used by Sauder & Williams (to great success). It also would be the first time for the new sliding gate air control made up specifically for use with this unit. This would be coupled with the in-line set up for the air speed gauge and pressure gauge. The extraction was from the bottom of the furnace, which had been constructed with a proportionally large tab arch. The image above shows Ken taking out the two bricks that blocked the arch during the smelt. (This was the first time Ken undertook an extraction.) As it turned out, there was a reasonably large slag block formed. The bloom proved properly positioned, and contained within the correct pool of liquid slag. With a bit of hammering, it was possible to break away the side of the slag and grab out the bloom. The finished bloom is shown above. After a bit of compression hammering, it was decided to slice off a third as seen to give to Lloyd. The bloom was both smaller and less dense than I had hoped for: Bloom Weight - 2 kg Total Ore - 18 kg * Total Charcoal - 150 L (about 30 kg) Total Time - 4 1/2 hours (not including pre-heat) The yield is a bit better than it looks at first glance. We baked dry a measured sample of the ore analog, and it was found to contain 12 % water. This puts the 'real' weight of ore used at closer to 15.8 kg. This gives us a yield of about 13%. Still lower than our usual, but enough that the DARC Dirt 1 analog is worthy of further testing. There is still a very large mass of hardened slag to break free of the interior of the furnace. This may prove to have other smaller masses of metal contained in it. Certainly it would appear that there is a larger proportion of slag formed than has been seen in past uses of the larger brick furnaces with other ore types.